As a prior horse owner and as a professional photographer I think equine photography is in my blood. Horses make dramatic and noble subjects and I’m looking forward to photographing more of them, for that very reason. When I was younger I always had horses and ponies, until injury forced me out of the saddle for good. I stay in touch with the equine world these days through my photography. I met this absolutely stunning stallion at a local event in West Sussex. I was able to see first hand how agile, responsive, and how intelligent he is. And on meeting him, he’s also wonderfully approachable and affectionate. His female handler described him as utterly trustworthy. There is often debate about whether fine art portraits should always be in black and white. I have never subscribed to that. I do engage in quite a lot of black-and-white portraiture (I photograph plenty of humans, not just animals - my portrait website can be accessed from the home page). But I’m a colour photographer first. The important thing is to be able to identify when an image looks better in black and white. Often removing the colour information can help to minimise distractions and focus on the subject. With this particular photograph that doesn’t apply, and I rather like the red head collar. This was an unofficial outing, but on a commissioned pet portrait photo shoot the process involves consultation with the client as to the end purpose of the photographs. For example, they may be looking for an album which chronicles the relationship with their horse or pet. And/or they might also want some fun or dramatic wall portraits. 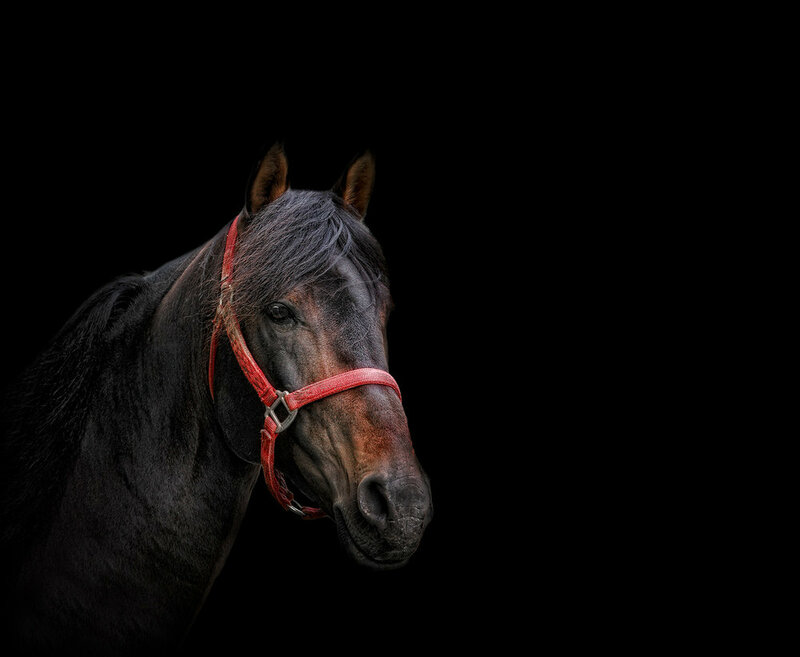 A fine art equine photograph like this has a more formal feel to it and is a good choice for a dining room. Knowing what we’re hoping to achieve from the outset is vital. But it’s equally important to be realistic - with animals we can’t always promise to capture an exact concept and it’s always a case of going with the flow.